UPDATE: Tree removals along Fairview Street are beginning this week and Fairview Street is to be closed to through traffic beginning the week of March 19th for construction work. The initial closure will be from the Boone Central Track and Field parking lot west to South 3rd Street. After this section is complete work will progress about a block at a time until work is complete at the west project boundary of South 6th Street. All work is expected to be completed by mid-July. The City of Albion is constructing Phase II of a multi-phase Storm Sewer project along Fairview Street in 2018. The Multi-phase project was identified as a recommended priority by the Albion Planning Commission in 2015 following a JEO Consulting Group, Inc. drainage study and report as ordered by the Commission in 2014. The 2018 Phase II project is not an initial paving project, therefore adjacent property owners will not be assessed for these improvements. The City plans to utilize Street Capital Improvement Funds from our Sales Tax and Street Funds to service debt on this new project. In 2018 and 2019, the City will be retiring Street Improvement Bonds from Downtown Street improvements that were completed in the early 2000’s. 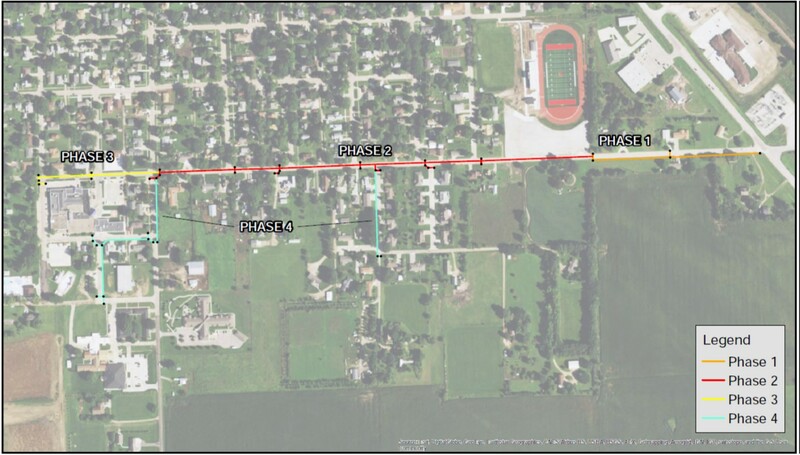 The Phase II Project, the largest phase of the plan, consists of installing underground storm sewer pipe along the South side of Fairview approximately from East City Limits (near the Track and Field Property) thence West to Sixth Street. Full width replacement of Fairview Street will also be completed from East City Limits to South Third Street. A five foot wide pedestrian sidewalk will also be constructed along the North Side of Fairview from First Street to Sixth Street. All construction work will be within existing City Right of Way. Phase I of the project was completed in 2016. Phases III and IV are yet to be scheduled beyond 2019 and would include Storm Sewer along Fairview from 6th Street to 8th Street, on South 3rd Street from Fairview Street to Fuller Street, on South 6th Street from Fairview Street to Fuller Street, on Fuller Street from 6th Street to 7th Street, and along 7th Street from Fuller Street to South Street. Full width street closures of Fairview will likely be necessary from time to time throughout this project. The hired contractor will communicate and work with property owners to provide as much access as possible. *Notification of the full lane closure will also be given to the Boone County Sheriff’s Department, Albion Police Department, Albion Fire Department, the Boone County Health Center and also made via the appropriate news and social media outlets. Plans are available for public review at Albion City Hall.